Police Cops is taking place at The Vaults, Waterloo. PRESENT DAY (1976). Straight-laced rookie Police Cop Jimmy Johnson is out to avenge his brother’s death, and (with the help of his new partner) he’s got to go it alone! Teamed up with a disgraced, retired renegade named Harrison, the pair begin to unearth the soily secrets that the case holds. Police Cops is a cinematic joyride, speeding down Adventure Avenue in a souped-up squad car. Oh, and did I mention...the steering wheel is made out of guns. Returning from complete sell out runs at the Soho Theatre, The Cape Town Fringe 2016 and the Edinburgh Fringe Festival 2016, Police Cops' (formally known as The Pretend Men) critically acclaimed, multi award-winning comedy blockbuster returns once more for an action packed hour of adrenaline fuelled physical comedy, cinematic style and uncompromising facial hair. Multi award-winning Police Cops (previously known as The Pretend Men) create highly playful performances which combine inventive physical storytelling with their own brand of comedic text. Parody and satire are centred at the heart of their productions, where they integrate with creative, dynamic stagecraft, supercharged physical theatre and cinematic style. 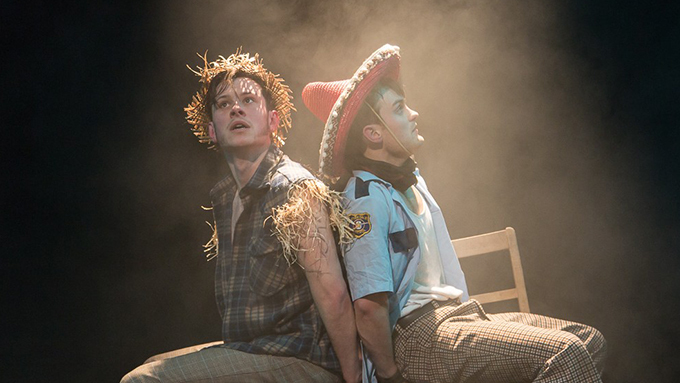 Imaginative concepts, exhilarating texts and musical flare, The Pretend Men create vibrant pieces of theatre that leave a lasting impression on their audiences.